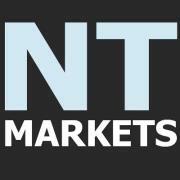 Tuesday 11th August -Market Wrap | Beeks Downunder-Because not all financial news is boring! 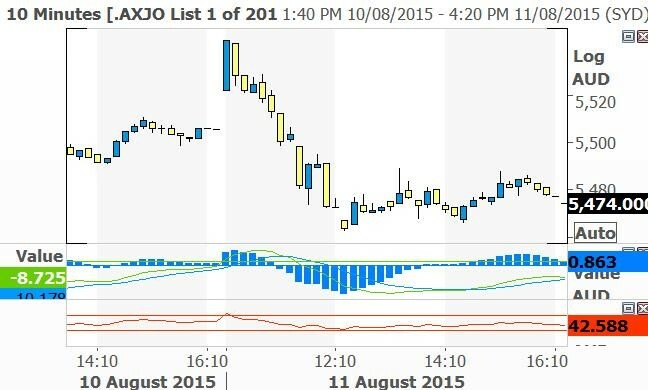 The ASX 200 fell 36 points to 5473.2 as banks weakened and corporate profits weighed. 80 point range. China kicks off the latest round of currency wars with a 1.9% devaluation of the Rebminbi. US futures down 13. Big day tomorrow! The action today. Strong start evaporates. Fair is foul and foul is fair. 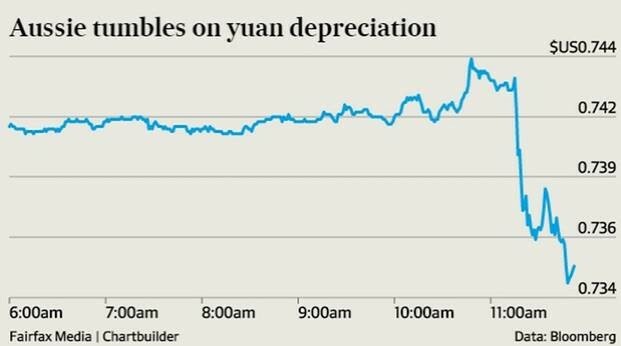 A solid start to the day was hijacked by corporate results and the moves from the PBOC to devalue the yuan. After the strong leads from offshore, we saw a plethora of results first thing which on the whole looked ok. To begin with at least. The market had other ideas though and after opening up strongly, around 35 points, it fell heavily as the selling in banks resumed and the volatility in corporate results weighed on sentiment. It seems there was more disappointment today than the Ashes performance. A large part of the weakness was down to the banks which look to be positioning themselves for another raising. Resources and energy stock escaped the sell-off in industrials. 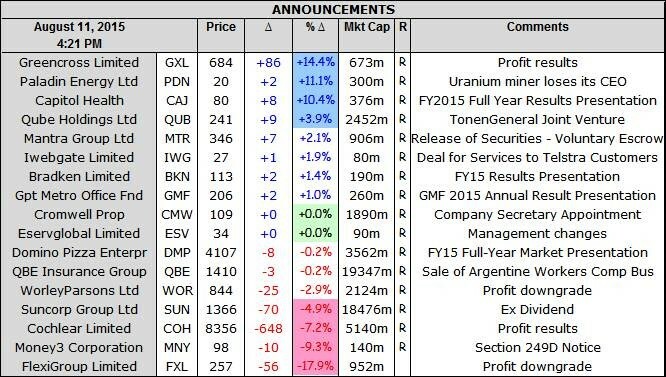 BHP +1.31%, RIO +1.6% and Fortescue Mining (FMG) +1.57%. Base metal stocks were also firm with Sirius (SIR) +2.46%, Sandfire (SFR) +5.77%, Oz Minerals (OZL) +3.92% and Iluka (ILU) +3.18% bouncing well. Energy stocks rose as oil prices surged on the back of stimulus hopes and a refinery outage in the US with Woodside (WPL) +1.82%, Oil Search (OSH) +1.3% and Santos (STO) +1.34% all looking strong. The biggest winner was Liquefied Natural Gas (LNG) +11.23% after being very much on the nose for some time now. Mining service giant Worley Parsons (WOR) –2.88% slipped today as it announced a $200m write-down of assets. Full year results on August 26 but now looking at a small loss following the write-down. Once again another mining services company talking of a ‘challenging environment’. In Industrials, some of yesterday’s positive moves were reversed with JB Hi-fi (JBH) -7.28% slipping back as shorts appear to have covered, as did Harvey Norman (HVN) –3.07%. Even Ansell (ANN) +3.65% reversed some of yesterday’s falls as did Orica (ORI) + 2.47%. In healthcare stocks CSL – 1.9% having touched 10243 cents last week. Other biotechs were also weaker with Starpharma (SPL) – 2.14% and Fischer and Paykel (FKH) -2.48%. The weakness in financials reappeared today after the exuberance of yesterday, with the Commonwealth Bank (CBA) –0.02% as its result looms with of course a potential raising. It is tipped to deliver a $9.15bn profit tomorrow. The largest ever for a local bank. There will be a number of important things to look for. Any capital raise obviously, any increase in bad debts, its view of the housing market and the outlook statement. Domino Pizza (DMP) -0.19% delivered, however investors took fright at the outlook guidance, although it did fight back well from a near 9% fall early. To be fair to the company, last year it issued guidance for a 20% increase, then updated it to 25% and delivered 40%. Once again it is forecasting 20% growth for next year, but that does not seem to be enough, with a high PE and a stellar run, it seemed that profit taking was the order of the day. This was its eighth consecutive year of profit growth, reporting a 40% increase in net profit to $64m in 2015. The result, which was underpinned by a 19.3% jump in revenues to $702.4 million, beat market consensus forecasts of around $62m and was well ahead of company guidance. In other results, Greencross (GXL) +14.38% has returned a 75% increase in revenue due to the expansion of its retail and veterinary network through new openings and acquisitions. The company’s net profit for the 12 months through June 30 was $19.1m on revenue of $644.5m, compared to last year’s loss of $127.8m on revenue of $368.9m. The company has opened a large number of new stores this year taking it to 200 and added 21 vet clinics. Dividend of 9c. Cochlear (COH) – 7.2 % announced today its FY net profit was boosted by strong sales of new products, especially in the 2H, rising 56% to $145.8m, which missed market expectations of around $156.1m. It issued guidance of $165m to $175m in 2015/16, once again below the current analysts’ forecasts. The company sold a record 26,838 cochlear implant units in 2014/15 – up 3% on the previous year. Stronger sales in the US and Europe were dragged down by lower sales in the Middle East. Transurban (TCL) – 1.28% another to announce today. The highlight was the take home pay of CEO Scott Charlton at $5.8m. Now you would think it is not the hardest job in the world to stand at the toll booths and just take the money. Certainly it’s hard to see why an established infrastructure company needs to spend that kind of money on a CEO but apparently it does. For commuters stuck in the almost continuous traffic of Sydney or Melbourne, it’s good to know Mr Charlton is being looked after. In the numbers the company has boosted toll revenue from the tollways it operates by almost 40% over the year to $1.56bn. The country’s largest toll road operator has also forecast a distribution of 44.5c per share for the new financial year, up 4.5c on 2014-15. It operates toll roads in Sydney such as the Lane Cove Tunnel and Melbourne’s CityLink. More bad news in the pay day lending market with Money3 (MNY) – 9.26 % suffering withdrawal symptoms after Westpac pulled the pin last week. Cash Converters (CCV) – 5.56% was also feeling unloved after a similar move from Westpac weighed. Paladin (PDN) +11.11% had a run today after a new CEO was appointed taking over the helm from John Borshoff. It seems that new shareholder, Chinese corporate HOPU, is stretching its muscles. HOPU’s Singapore-based clean energy arm took a stake of about 15% in Paladin last November as part of a $205m recapitalisation that brought relief to the balance sheet and paved the way for stronger ties with Chinese utilities. The news of a new CEO was also matched by moves in Japan to restart a nuclear reactor bringing some hope for the sector. Paladin was recently trading at a price not seen since 2004 of around 17c. Never good to lose a chairman unexpectedly, Flexigroup (FXL) – 17.89% has felt the wrath of investors as Chris Beare has announced he is leaving coupled with a number of broker downgrades also slipping through. In economic news, NAB said business confidence dropped 4 index points, to 4, between June and July, while respondents found business conditions had also deteriorated, from 10 to 6 points. However the big story of the day is the PBOC’s move to devalue the yuan by 1.9%, the most in two decades. This move came as a surprise although the PBOC said that this was a one off and they were looking to stabilise the market at a ‘reasonable’ level. This is the big game in town with currency the big battle ground. It seems now that the de facto peg that the world has got used to is now broken. The moves by the PBOC were enough to upset the AUD and it fell around one cent from 74.40 to 73.50 with other regional currencies hurt as well. Further weakness ensued and currently at 73.15 cents. New Chinese data show that the Shadow Banking system was hit hard by the falls on the equity market in July. “Aggregate financing,” the broadest measure of Chinese new credit available, was just Rmb718.8bn ($116bn) last month — 61% lower than a month earlier, according to the National Bureau of Statistics. It’s also 29% below forecasts. Meanwhile, the M2 measure of money supply rose at an annual pace of 13.3%, up from 11.8% in June. This is the fastest pace of money supply growth since June 2013, reflecting stimulus efforts from authorities and measures to stem the bloodletting in the equity markets. Also in another sign of a fading economy, Chinese consumers bought the fewest passenger vehicles in 17 months in July to the lowest level since February 2014, extending a slump in the world’s largest auto market as deeper discounts failed to revive demand. 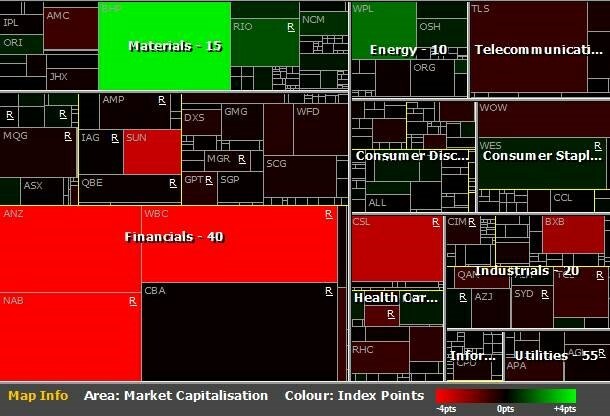 In Asia equity market were relatively quiet with small losses. Japan is currently down around 0.42% whilst Shanghai up 0.3% and Hong Kong up 0.69%. Expect Europe to kick off on a slightly negative note despite the big US rise last night. It also looks like the Greek government and the Troika have finally agreed on terms and the bailout looks set to proceed. One more risk ticked off for the Fed to be able to raise rates. So who will win, Yellen with September or the others with December? And finally some sage advice from Woodford Investment managers in the UK. What holds true in the UK, also works in Australia no doubt. Dow Jones Futures down 76 points. Dow Jones was up 241 points overnight.